Pittsburgh is in the midst of a modern Renaissance, so it’s the perfect city to host the original Renaissance Man, Leonardo da Vinci. 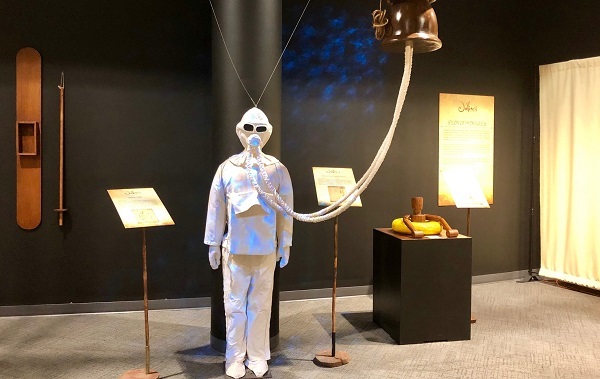 Opening Saturday, Carnegie Science Center hosts “Da Vinci The Exhibition,” a traveling, interactive display that details the life and achievements of the Italian artist and inventor who died 500 years ago this May. Pittsburgh is the seventh North American city to welcome the show in its current format since 2014. Created by Aurea Exhibitions and produced by Imagine Exhibitions, the showcase occupies two floors of the new PPG Science Pavilion. Tom Zaller, president of Imagine Exhibitions, says the Da Vinci retrospective encapsulates all the reasons why he got into the business 20 years ago. 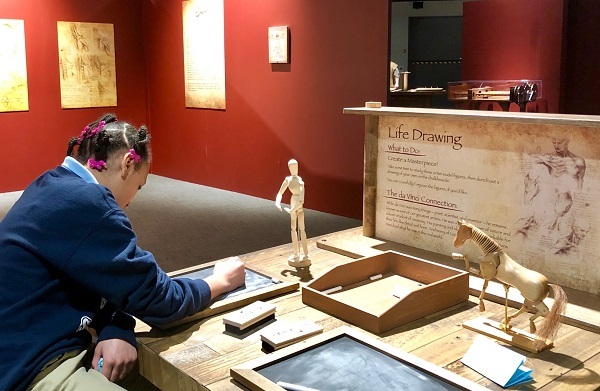 Long ago, Da Vinci advised to “study the science of art and the art of science.” Visitors get a chance at both here with 60 life-size reproductions of da Vinci’s inventions, 20 art replicas and 31 hands-on exhibits. Leonardo Da Vinci was a man ahead of his time. His designs include underwater breathing devices. Kids can look for the green “go” labels where interaction is welcome. 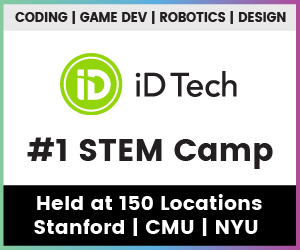 Climb inside an armored tank, pose next to an underwater suit with breathing apparatus, or close the doors inside a mirrored room, similar to that which Da Vinci used to see all sides of a figure while at work. Kids will relate to Da Vinci, a lifelong learner who epitomized curiosity. 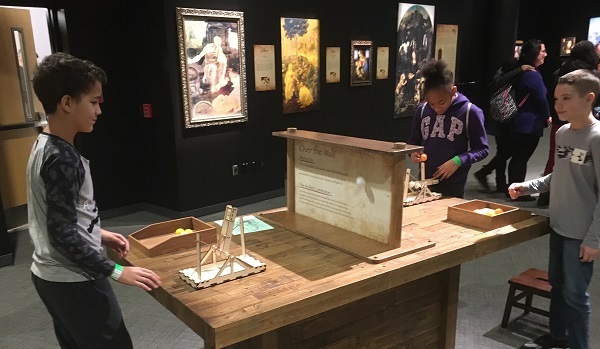 Helping them make the connection, the Science Center team added its special touch with fun activities related to Da Vinci’s contributions to art, engineering and flight. Da Vinci’s combined love of art and science come together in sketching life studies. Using Da Vinci’s early designs, kids can make paper helicopters that rise and spin, learning how to make engineering adjustments for better control. At the mirrored table, they can mimic Da Vinci’s secret code by writing backward from the right instead of the left. Puzzler tables allow kids to problem solve. Other stations promote life drawing with human forms. 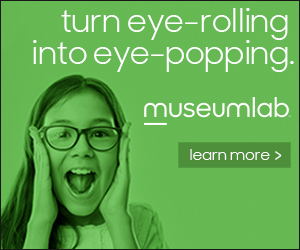 This exhibit inspires kids to explore their interests to the fullest, whether they’re drawn to the “Mona Lisa” and figure drawings or intrigued by STEM concepts, such as shooting catapults and manipulating gear mechanisms. Engineering skills are explored through shooting ping pong balls with a catapult. While kids focus on the activities, grownups will be engrossed with the true-to-size painting reproductions – his enormous “The Last Supper” stretches across 30 feet – and the art lessons learned through them. It took hundreds of years for many of Da Vinci’s ideas to be proven viable. Through his study of the heart, he learned that arteries can clog over time and how valves open and close, but it took medical science until the 20th century to come to the same conclusion. Another example: His plan to build a bridge over the Gulf of Istanbul has not only been established as sound engineering, but construction is now underway. 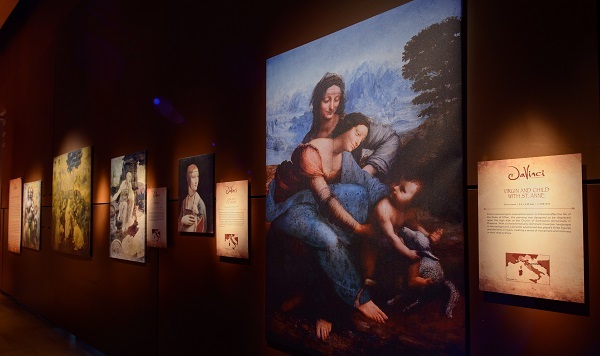 A collection of Da Vinci’s most renowned paintings are reproduced in actual size. Photo by Al Powers, PowersImagery.com. The fascination continues with additional programming focused on Da Vinci’s legacy offered throughout the show’s run. An online education guide will help teachers make connections between their in-class lessons and the exhibition. Parents can access it, too, for cool paper airplane designs and other experiments to try at home. The exhibit hits close to home for Jason Brown, the Science Center’s interim director and senior director of science education. His dad was a professor of classics with a great collection of books. As a child, Brown spent hours in his father’s study, paging through one special book. That book now sits on a shelf in his office at the Science Center. The subject is Leonardo Da Vinci. “Da Vinci the Exhibition” runs through Sept. 2 and requires a timed ticket, which may be combined with Science Center admission. Is It OK for my kid to start her own YouTube channel? Check out these safety measures.